A Bird's Eye View of Smithfield Market taken From The Bear & Ragged Staff. bl.uk > Online Gallery Home	> Online exhibitions	> King George III Topographical Collection	> A Bird's Eye View of Smithfield Market taken From The Bear & Ragged Staff. 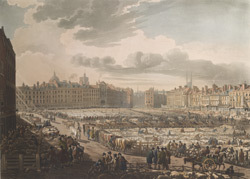 View of Smithfields, the famous meat market in London. Although it was used as an animal market and a place for public executions for hundreds of years previously, in 1638, the City of London Corporation established a cattle market here. At the time it was just outside the City Walls, but as can be seen in this view of 1811, over time the city spread up around it. It was a smelly, noisy place and there were frequent complaints of drunken herdsmen and unruly cattle on the way to Smithfields.